The Barcelona Series is made up of fifty lithographs, printed in stark black during the summer of 1944 (in Barcelona, hence the name). It is difficult to say if it is one work or 50. Each is individual but, at the same time, it is the cumulative effect that makes up the work as a whole. It is for this reason that we have borrowed Miró’s own copy of the prints from the Fundació Joan Miró. He only printed seven of each image, of which he kept back one for himself and one for his friend and publisher Joan Prats. Even this very small print-run was a major undertaking because, with 50 plates, it required at least 350 sheets of paper (more, if you include test proofs). At a time of austerity, with Spain virtually cut off from war-torn Europe, this was rather a remarkable thing to be doing. The prints act as a thread through three adjacent rooms in the exhibition (Rooms 5-7), reflecting how they were first planned around 1939 and matured over five years. They are extraordinary: huge-headed figures are both comical and bewildered, some threatening and some threatened, endlessly complex and challenging. Matthew Gale is head of displays at Tate Modern and co-curator of Joan Miró: The Ladder of Escape. While I regarded the exhibition as an utterly outstanding collection of MirÃ³'s work, I was, however, wholly disappointed with the high volume of people permitted to enter the galleries at each of the allotted viewing times, which made for a most uncomfortable experience. Doubtless the staff would state this was to ensure a higher proportion of exposure, although the more cynical might see it as simply a calculated opportunity to increase revenue. I thoroughly enjoyed the exhibition. Favourite picture - The Rut - made me smile but the self portrait made me very sad. Enjoyed the exhibition very much and learnt much from it. There was a lot to take in but I didn't feel overwhelmed by the number of exhibits. It would have been more enjoyable if there had been fewer people but we did go on a Sunday so expected a fair number. Wished we had taken our 6 year-old grandson who, we think, would have loved the lithographs.The highlights were the tryptichs and the paintings on copper - such wonderfully bright colours. Like most major retrospectives there was so much to take in but for me it offered the chance to see a greater range of work then I perhaps was aware of before. The highlight was the lithographs, energetic and dynamic, and as mentioned above full of 'monsters' depending on your point of view of course. Influential beyond the 'fine art' world in so many ways. It's a very interesting exhibition. Nevertheless, I was disappointed there was no langage but english for the explanations and books. This was an excellent exhibition. I am not a fan in general of abstract art and found some of the later exhibits hard to comprehend. However, those dating from the Spanish civil war years were very moving. My daughter particularly liked, as did I, the early pastoral paintings and we both agreed that more of these would have lightened the genrally "dark" mood of the exhibition. I also enjoyed it. I like the commentary which helped explain some of the detail and to spot the detail and recurring images. Without it I would not even have understood the title of the exhibition. There was a good balance with biographical information as well. And the layout meant I went wow at the very end with both the Cell of a Recluse and Hope of a Condemned Man; & that type of picture I normally don't like. A geat day out for me and my sister. Thanks. It was a brilliantly curated exhibition - those pictures need space and they got it. Room 1 was a surprise to me My favourites were the burnt paintings and the series on copper - both a real eye-opener. Spent quite a time trying to relate some of the titles, and also why the ladder symbol was chosen over some of the more frequent ones. A huge success - as good as the Gaugin. I love the show and have already visited three times but hope to make it again before it closes. Seeing the complete 'Barcelona Series' of lithographs was a real treat. 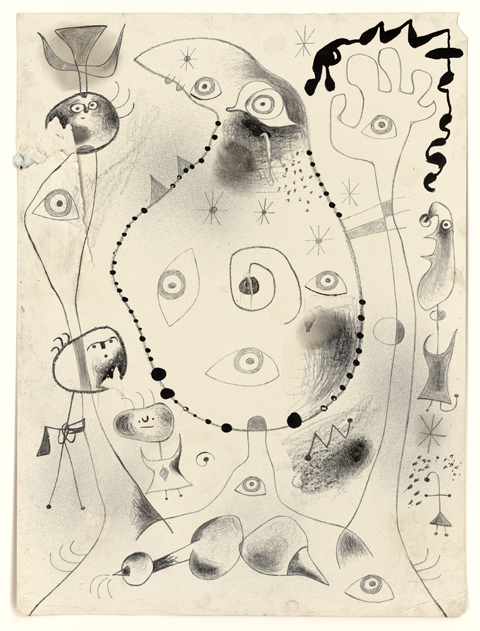 I was just disappointed that you didn't include more of MirÃ³'s wonderful etchings and aquatints which form such an important and ground-breaking part of his work. But beautiful show - thank you. I bought a catalog in Barcelona at the Fondacio Miro. But it was a book actually. Unfortunately it was lost in the mail so I can't give you more information.